Sony Xperia Z Ultra is world's thinnest Full HD phone | What Hi-Fi? 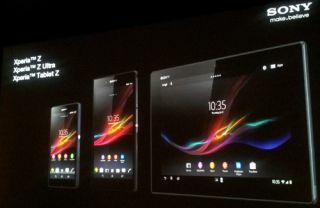 Sony has officially launched the Xperia Z Ultra, the company's first big-screen 'phablet' and the world's thinnest Full HD smartphone. The Xperia Z Ultra release date looks to be around September, while the Xperia Ultra Z price looks to have been revealed as around £600. The Xperia Z Ultra has a 6.4in screen, which uses the same Triluminos technology seen in the company's 2013 TVs and the latest Bravia X-Reality Engine. The Z Ultra is waterproof and dustproof and can be controlled with a pencil. Inside is he latest Qualcomm Snapdragon 800 2.2GHz quad-core processor and support for 4G LTE. Claiming to be the thinnest full HD phone, the Xperia Z Ultra is just 6.5mm thin and weighs only 212g. Sony says the Xperia Z Ultra is the thinnest they could make the phone with the existing 3.5mm headphone connection – though Huawei might disagree with its Ascend P6 smartphone, which is just 6.18mm thin but settles for a 720p screen. The new Sony phablet has a 3000mAh battery, 8MP camera and a waterproof IP58 rating, complete with a waterproof headphone jack. That waterproof design even means you can film full HD underwater. Not bad. The Sony Xperia Z Ultra will include a "free content offering", which looks like a trial for the Sony Music Unlimited service. The Xperia Z Ultra is available in a range of colours, black, white and purple, and there's the option of a magnetic charging cradle that charges via a magnetic port, no need to remove the protective flap on the phone.